The Vital faculty is the first and most important faculty because it gives the organism life. It is centered around the heart and lungs and includes the respiratory, circulatory and immune systems. Besides giving life to the organism and empowering cellular metabolism, the Vital Faculty also activates and coordinates responses of the organism as a whole to its environment. This includes the immune response. And so, the Vital Faculty acts as a central nexus for the whole organism. The heart and lungs are the central core of the Vital Faculty, and work closely together. 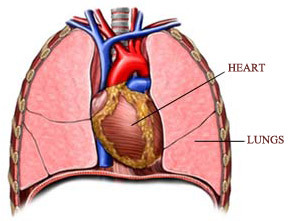 The lungs function like a bellows, pumping fresh, raw pneuma to the heart. This fans the flames of the heart, which acts like a furnace, combusting the raw pneuma into the Vital Force and Innate Heat, which it infuses into the blood. The fresh blood, infused with these vital principles, is then pumped out to every cell, organ and tissue of the body via the arteries and the circulatory network. The Vital Force: The basic, primal form of kinetic energy in the organism, which powers all bodily movement and function. The Vital Force is then converted and specialized into other forms of pneuma or kinetic energy by the principal organs of the Natural and Psychic faculties. The Innate Heat: The basic, primal form of thermal energy in the organism, which powers all pepsis - digestion, metabolism and transformation. The Innate Heat is then converted and specialized into other forms of ignis or thermal energy by the principal organs of the Natural and Psychic faculties. Together, the Vital Force and Innate Heat power all cellular metabolism in the body. The Vital Force and Innate Heat then fuse together to create the thymos, which is the distilled essence of the Vital Faculty. Thymos, which means, "fierce, proud, bold" in Greek, is the immune force of the organism, and powers the immune response. The thermal aspect of thymos asserts the metabolic presence of the host organism, and so keeps parasites and microbes, with their foreign metabolisms, at bay. The kinetic aspect of thymos mobilizes the immune response and activates its biological intelligence. Like the Vital Force and Innate Heat, the thymos is also carried by the blood to every cell, organ and tissue of the body. The circulatory network is the great central highway of the Vital Faculty. Branching out from the heart in all directions, it is also called the vascular tree. The circulatory network includes the arteries, capillaries, veins and lymphatics. Since it branches out from the heart, the circulatory network pertains most to the Vital Faculty. However, it is also used by the Natural Faculty to transport the Four Humors. Blood, one of the Natural Faculty's Four Humors, is the physical vehicle used by the Vital Faculty to transport the Innate Heat, Vital Force and Thymos. The endocrine glands also use the circulatory network to disseminate hormones. All these factors, plus its ability to connect and integrate all parts of the organism, both superficial and deep, make the circulatory network a very useful and versatile system. The circulatory network has four gateways, or portals of entry and exit. These are the lungs, liver, kidneys and skin. Since the Natural Force is derived from the Vital Force, and the Metabolic Heat from the Innate Heat, the Natural Force and Metabolic Heat produced by the Natural Faculty can only be as good as the Vital Force and Innate Heat produced by the Vital Faculty. Since the Natural Force and Metabolic Heat in the liver generate the humors, ultimately, the quality of humors generated can only be as good as the Vital Force and Innate Heat generated by the Vital Faculty. Inferior quality blood generated by an inferior quality Natural Force and Metabolic Heat, derived from an inferior quality Vital Force and Innate Heat, won't be a very good vehicle for carrying the Vital Force and Innate Heat to the Natural Faculty, resulting in the generation of an even lower quality of humors. This becomes a vicious circle, and also affects the quality of thymos generated, compromising immunity. Blood is the humoral link between the Vital and Natural faculties. Therefore, it's important to keep the blood pure, vital, and of high quality, to make it a better vehicle for the vital principles. The brain, or head thinks, and the heart feels. The heart feels what the head thinks, and ultimately all thoughts have their emotional and feeling repercussions on the heart. This is the mutual communication or feedback loop between the Psychic and Vital faculties, or head and heart. The essence of what the heart feels is embodied in the Vital Spirits that surround the heart. Expansive, joyful, noble feelings and emotions expand and strengthen the Vital Spirits, whereas base, ignoble, constrictive feelings and emotions contract and weaken the Vital Spirits. If the strength and quality of the Vital Spirits are good, plenty of good quality Vital Force, Innate Heat and Thymos will be generated in the heart, which will in turn have a beneficial vitalizing effect on the whole organism. The thoughts we habitually think and our prevailing mental outlook have a profound effect on the Vital Spirits, and on the quality of Thymos and other vital principles generated in the heart. Since the Thymos is responsible for the immune response, our habitual thoughts and attitudes can affect our immunity. And so, Greek Medicine was into psychoneuroimmunology long before it became the latest buzzword in holistic medicine. It's an accepted fact that our mental and emotional states affect our breathing patterns, and vice versa. If our mind is plagued by fear and anxiety, our breathing becomes rapid and shallow; a few long, deep breaths will calm the mind. The brain also needs a lot of fresh oxygen, or pneuma, supplied by the lungs, heart and Vital Faculty. If we're not breathing right, our brains cannot think and function at full capacity.